There are regular reporting features built in to Google Analytics but what if you want to do customised reporting or other regular data collection and integration techniques? One answer is Google Apps Script. 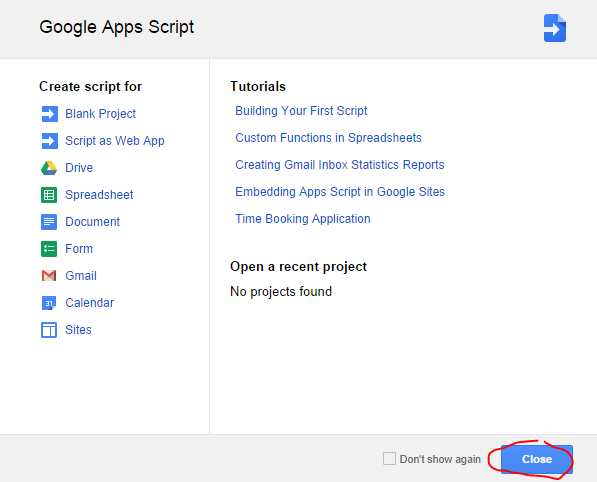 Apps Script is a Google Drive feature that makes custom automation so much easier. The big advantage of Apps Script is you are already in a Google authenticated environment. 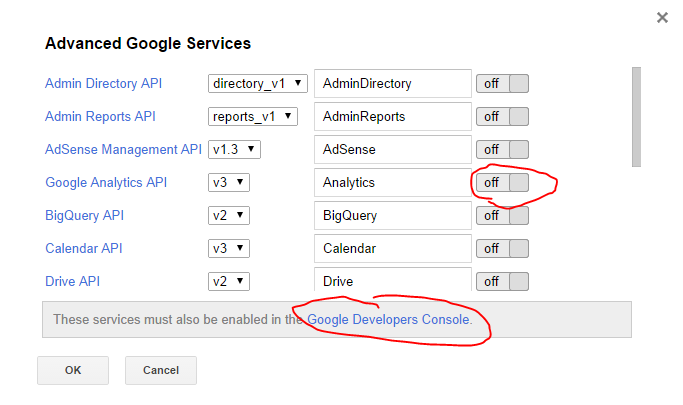 So while anyone can use the existing Google Analytics APIs using Apps Script you don’t need to worry about the authentication handshake to get your data. 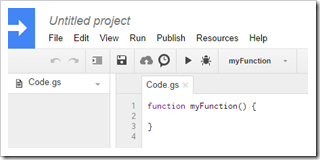 This means that you can access Google Analytics data in one line of code. There is a couple of tickboxes to get to that one line of code but in this tutorial I’ll walk you through the process. Note: You can also get Google Analytics (and other analytics data) in a Google Sheet with zero lines of code using add-ons. The current limitation of these is they cannot currently be automatically run on a scheduled basis. At this point you will be prompted to create a project name. Enter a name for your project and click ‘OK’. You should now see a list of available advanced services. 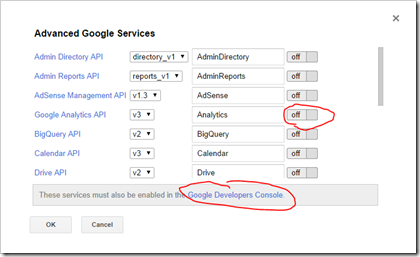 For this project we want to just turn on Google Analytics API by clicking the on/off toggle. So far we have enabled Analytics in our project but we also need to click on the Google Developers Console link highlighted to enable this at the console end. Once enabled in the Developer Console you can close this tab/window and click OK in the ‘Advanced Google Services’ box in your Script Editor. To recap our project is now configured to use the Google Analytics API. You can use multiple advanced services in the same project as needed. Remember ‘Advanced Services’ need to be enabled for each project you create but this only needs to be done once for each project. ids – Unique table ID for retrieving Analytics data. Table ID is of the form ga:XXXX, where XXXX is the Analytics view (profile) ID. startDate – Start date for fetching Analytics data. Requests can specify a start date formatted as YYYY-MM-DD, or as a relative date (e.g., today, yesterday, or 7daysAgo). The default value is 7daysAgo. 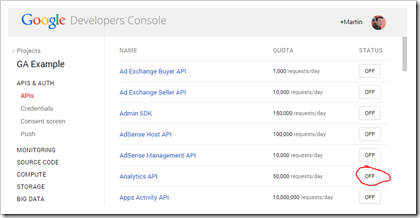 endDate – End date for fetching Analytics data. Request can should specify an end date formatted as YYYY-MM- DD, or as a relative date (e.g., today, yesterday, or 7daysAgo). The default value is yesterday. metrics – A comma-separated list of Analytics metrics. E.g., ‘ga:sessions,ga:pageviews’. At least one metric must be specified. 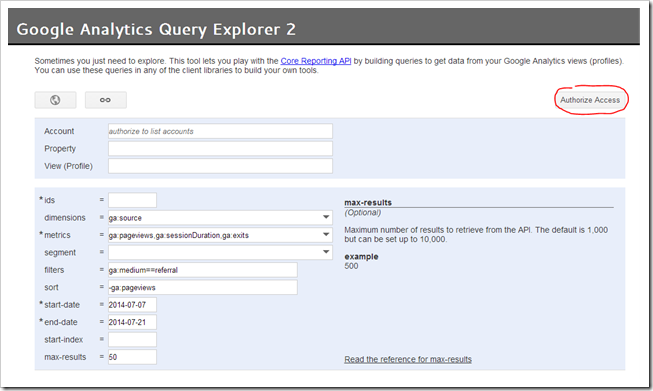 If you haven’t used the Query Explorer before you’ll need to click on the ‘Authorize Access’ button, which will enable a ‘Get Data’ button. You can test and tweak your query as much as you like using the ‘Get Data’ button to see what is returned from your Google Analytics accounts. 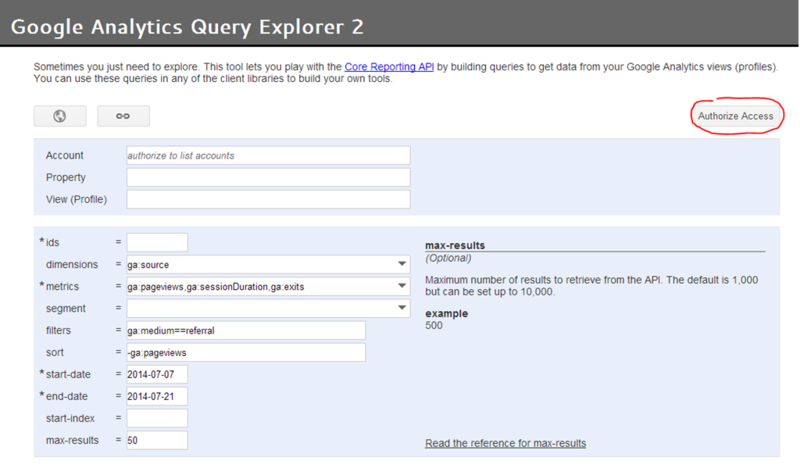 The Query Explorer is a great starting point but remember it only contains a few of the optional arguments. The little helper script gives us some extra code to store/pass the parameters we need. If you are scheduling this script to run on a regular basis you’ll need to modify the start/end date in the query. The are two main ways you can do this: either building the date by manipulating a Date instance formatted as YYYY-MM-DD; or as a relative date (e.g., today, yesterday, or NdaysAgo where N is a positive integer). Below is an example of a modified query made with the Query Explorer and exported to generate the script we need which gets data from the last 7 days. In this example I’ve wrapped it in a new function name fetchMyQuery. Note: In your example you need your own ids value to return results. With your script saved we can test the code. When developing scripts there is a debug feature demonstrated in the video below (the first time you run a new script you need to authorise it. This only needs to be done the first time the script runs or when new permissions are required. Debugging/testing Google Apps Script from Martin Hawksey on Vimeo. This function inserts all the header and reporting data to the sheet. For more information on how to insert data into Google Sheets with Apps Script there is a Storing Data in Spreadsheets tutorial. When you now Run > fetchMyQuery you should see the data written in the sheet you specified. The Events dropdown to: Time-driven, and selecting Week timer to run Every Monday between 7:00 a.m. to 8:00 a.m.
Once saved this script will run as scheduled with no need for your to have the sheet open. If you would like to be told if the script fails whilst unattended click the notifications link which opens a new dialogue box to allow you to configure to which email you want errors to be sent and when. 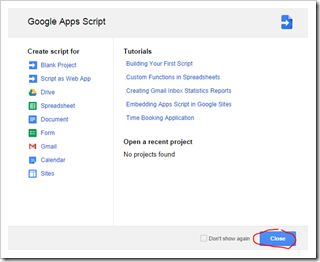 This post has introduced you to using Google Apps Script to automatically collect and write Google Analytics data to a Google Sheet. Once you get started with Apps Script you’ll start discovering many more opportunities to automate tasks. For example, as part of our triggered event we could notify people of an update using the MailApp service or write an entire document using Document Service. For some ideas you might want to read about Analytics reporting with Google Apps Script at the UK Cabinet Office. If you are just starting to use Google Apps Script the Google Developers has extensive documentation and tutorials and if you get stuck there is a dedicated tag in Stackoverflow and an active community on Google+.